1) Preheat oven to 204°C and grease an 8'' round pan well with canola oil. 2) Mix each portion evenly. 3) Fold in Portion A into Portion B and stir till well combined. 4) Add in mango puree and mix well. Throw in the bread cubes. 5) Soak the bread cubes and let stand for 15 mins. 6) Line the bottom of greased pan with sliced bananas. 7) Pour the batter into the pan layered with mango cubes. 8) Bake for 30-35mins or until the edges brown and puffed up. This taste awesome with just banana only rather than mango actually. When I made this the second time, I used bout 3 bananas, 2 mashed, 1sliced to line bottom of pan. 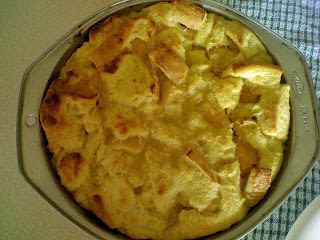 0 comments on "Mango & Banana Bread Pudding"